For Watford, you could see the jubilation amongst the 33,000 that made the short trip south for the semi-final, having seen their team pull out a stunning second-half performance involving a last minute spot-kick to send them through. Conversely, you could see the disappointment and sorrow amongst those in orange at the southern end of the ground after letting a two goal lead drop. The similarities however? Both teams cared. They both cared badly. Compare this to the other semi-final where Manchester City ran out 1-0 winners over Brighton thanks to a diving header from Gabriel Jesus in the opening exchanges. Yes they were happy when they scored. Yes they were happy at the full-time whistle. However, something just doesn’t sit right with me. Brighton gave the league-leaders a good run for their money in front of the 35,000 travelling seagull fans. 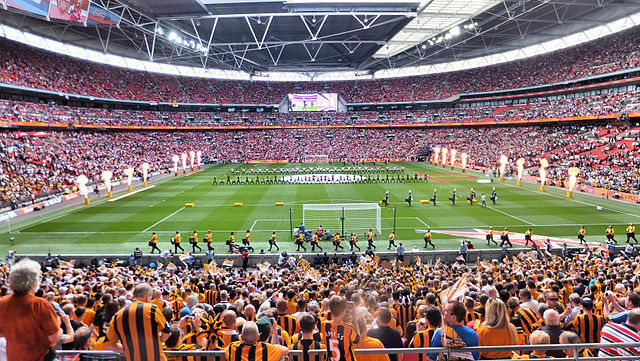 It was also their first appearance at the new Wembley in the usual context (they played Tottenham there when it was used as their temporary home ground). They embraced the occasion. For City though, this was routine. It was the fourth time The Citizens had visited the national stadium just this season alone, competing for the 2018 Community Shield, the Tottenham league fixture and the Carabao Cup final. Now they’re heading back for a fifth time. To say the novelty has worn off would be putting it lightly – City failed to sell out their allocation for the semi-final and sent tickets back prior to the game. What I’m trying to get at here is that the FA Cup is not dead, it just really is contextual to the team you support. As a Portsmouth fan, the FA Cup has a very special place in our hearts. We’ve won the competition twice and as a club currently competing in the third tier of English football (sadly), the FA Cup is still something we take very seriously. There is also nothing better than seeing a lower league club going on a cup run, giving the players and fans an opportunity they have never experienced before, let alone if they knock someone big out. This year’s dark horses were Newport, currently in League Two, who somehow managed to make it to the fifth round. For a club who went through financial turmoil and had to start-up new, working their way back through the leagues to make it back professional, this was the highlight of their most recent history. Many had never seen anything like it, being over 70 years since the club had made it to the same round. It was a momentous occasion for those County fans, who had seen their club go from doom and gloom to creating one of the most emphatic cup stories ever. It was a momentous occasion for those County fans, who had seen their club go from doom and gloom to creating one of the most emphatic cup stories ever.